Pumps, control valves, traps or any other equipment controlling the flow of liquids or gases require proper protection with strainers for trouble-free operation. Sterlco® strainers are engineered for water or steam, and are adaptable for many other uses. Cleaning is accomplished by simply removing a pipe plug without disconnecting any piping. Or if it is desirable to clean without interrupting service, a blow-off valve can be connected to the cleanout opening. The 18-Y strainer body is a sturdy red brass (steam bronze) casting. Standard units have 40-mesh brass wire screens. Available on special order with brazing connections instead of pipe threads. For special service requirements, both 20-Y and 18-Y strainers can be furnished with a wide variety of perforated metal and wire mesh strainer screens. 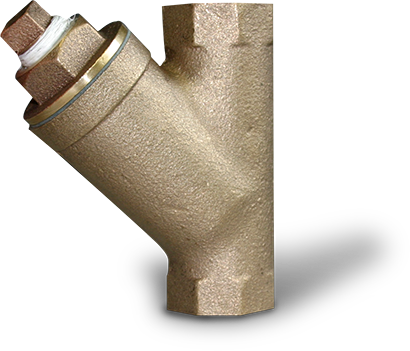 The 20-Y strainer has a heavy cast iron body, with accurately machined pipe thread inlet and outlet. Standard units have 20-Mesh Stainless Steel Wire Screen for sizes 1/2” to 2”; Stainless Steel Screen – 3/64” Diameter Perforations for sizes 2-1/2” and 3”. Flanged models use Stainless Steel Screens – 1/16” Diameter Perforations. Sterlco® strainers are engineered for water or steam. Adaptable for a variety of fluid handling applications.